Anyone who has ever met Amos Hinton, the Director of Agriculture for the Ponca Tribe of Oklahoma, can attest to his formidable determination. In two and a half years he has gone from a department of one, working with a small tractor he ‘borrowed’ from the maintenance department, to a current team of 12 employees, plus volunteers, farming on hundreds of acres with 325 horsepower tractors, producing thousands of pounds of food per year for his tribe. The agricultural program was founded in 2012, and is administratively housed under the health department, which utilizes the produce in their programming. The Ponca Tribe of Oklahoma (the southern relatives of the Northern Ponca Tribe in Nebraska) was relocated to Indian Territory in 1877. There they settled on a 101,000-acre reservation near the confluence of the Salt Fork and Arkansas Rivers in present day Kay and Noble Counties. In 1892 the reservation was allotted, resulting in a great deal of Ponca land being lease or sold to settler farmers, including the Miller brothers of the 101 Ranch (a 110,000 acre operation that was the nation’s largest diversified farm and ranch). In addition, the development of the Tonkawa and Ponca oil fields in the early 20th century caused environmental issues, forcing the Ponca to abandon winter camps along the Arkansas River and move onto individual allotments. The original 102,000 acres originally allotted to the Ponca has shrunk down to about 35-40,000. 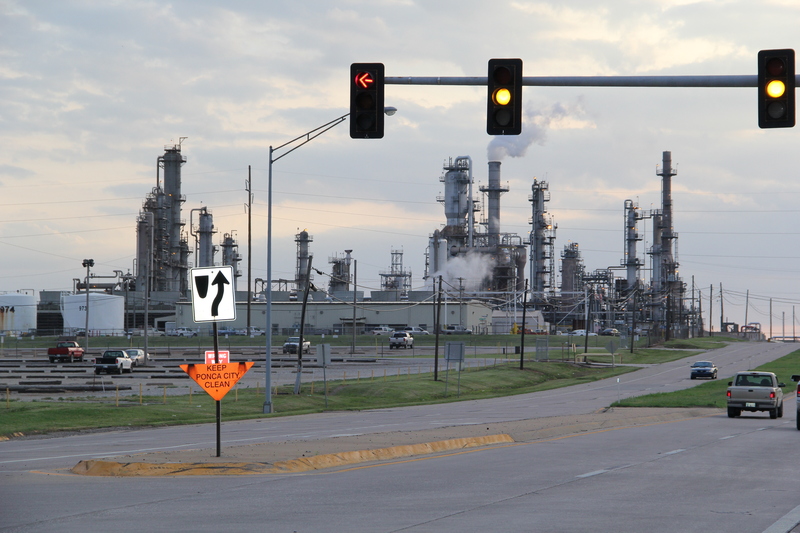 Ponca City was home to two oil refineries operated by ConocoPhillips and Phillips 66, which recently merged into one operation run by ConocoPhillips. These refineries have provided jobs for residents and tax dollars that sustain local schools, but have also contributed to a decline in environmental quality. Local people, including the Ponca tribe, have been active in holding these industries accountable. Residents sued Conoco Oil Company (now called ConocoPhillips) in 1990 blaming unusual rates of cancer, birth defects, skin rashes, breathing problems and other illnesses due to chemicals like benzene, toluene and xylene that had leached from storage tanks and contaminated their water. Conoco agreed to buy 400 homes near the refinery, and set up a $5 million fund for families in surrounding neighborhoods. Ponca City also supports other polluting industries, like Continental Carbon and Oklahoma Gas and Electric, which has been locked in legal battles with the EPA over emissions. In addition, the Continental Carbon plant lies on the southern outskirts of Ponca City. This industry produces a fine, black powdery substance called carbon black, which the Centers for Disease Control and Prevention lists as a potential human carcinogen. Carbon black is used to strengthen tires and other rubber products, and as a pigment in inks. Continental Carbon was emitting carbon black into the neighborhood, which coated homes, cars and farm lands and aggravated residents allergies and asthma. 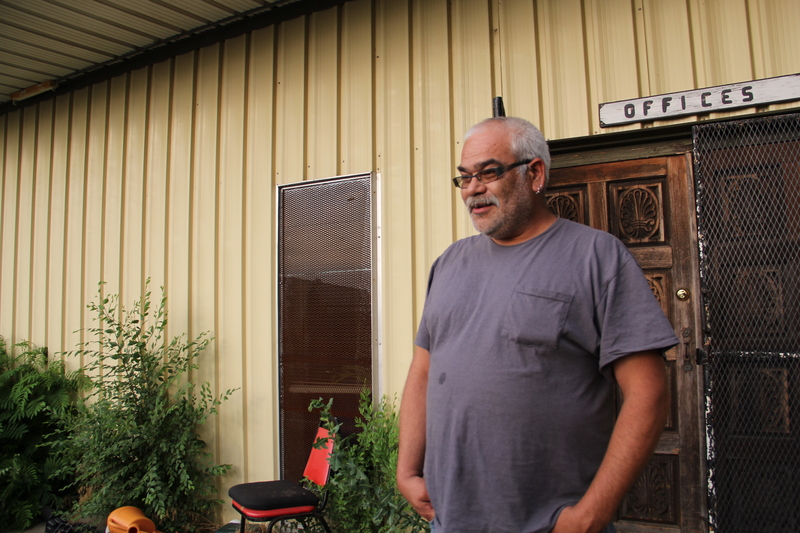 In 2009 Continental Carbon settled with residents, including farmers like Amos, and bought out and tore down 11 homes. Aside from these challenges, Amos’ main concern regarding the health of his people is diet related. As he expressed, “My people are dying way too young because of what we eat. The commodities that we’ve been given all these years has done this to us.” The death of his brother and a number of other relatives and community members from cancer prompted Amos to develop a program that would help make healthy, locally grown food more accessible. In February 2012 he wrote his first grant, on a computer so old it still used floppy discs, and was successful in acquiring $25,000 from the First Nations Development Institute. Since then he has also been able to acquire funding from the Shakopee Mdewakanton Sioux tribe, AARP, Winona LaDuke, and WK Kellogg Foundation. 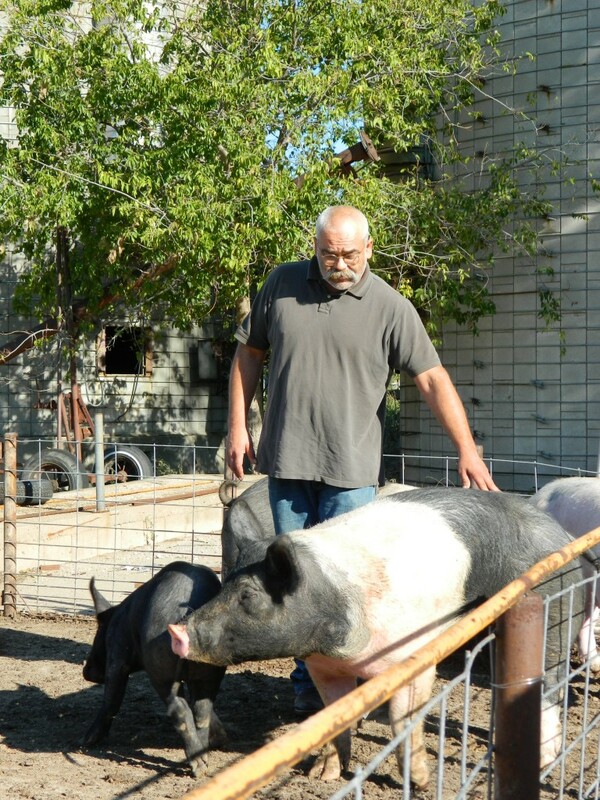 The first project Amos took on was breeding and raising pigs, in an effort to provide a leaner protein to community members. Most of the pork is used in the Title VI Elders Nutrition Program, with additional sausage sold to tribal members for $2 a pound. Last year when funding ran out for the Elders Nutrition program, Amos’ program donated 600 pounds of pork for their meals. In the last year and a half, he has donated over 6,000 pounds of meat to community members. The program currently owns three young female and one young male pig, and is expecting piglets shortly. In addition, the agricultural program maintains a 12 acre garden, grown entirely without chemical inputs, even though this means more labor for Amos and his staff and volunteers. The first year of the program, this was a field of trees. 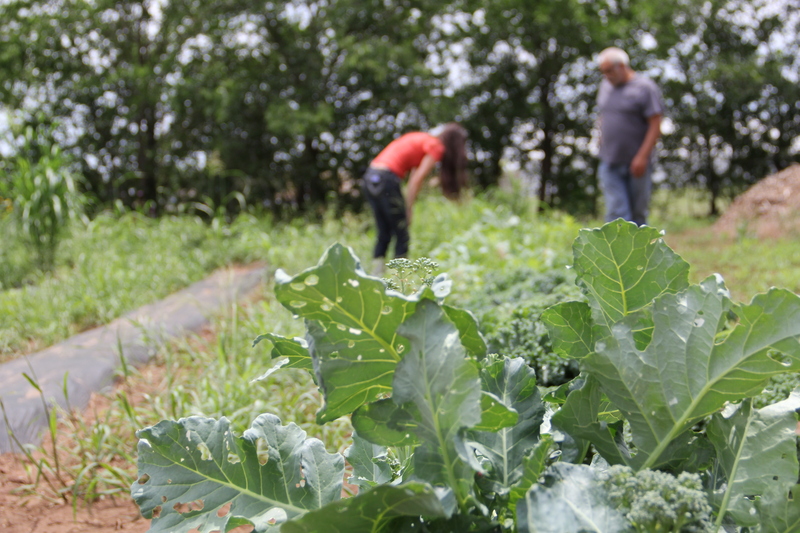 The next year, they fought back weeds, but produced 12,000 pounds of produce. This year they’re fighting weeds, but Amos is determined that they will pick at least 24,000 pounds of produce (he’s determined to at least double his program’s output each year). The produce from the garden goes to the Head Start program as well as the Elders Nutrition program, and additional produce is dropped off at the health clinic, and to the mission in town which feeds Ponca City’s homeless. Another garden Amos is working on is in collaboration with the Otoe-Missouria tribe. In March 2013, the two tribes received a joint grant from the Native American Young Beginning and Small Enterprise Center, which funds agricultural education programs for the tribes’ youth, as well as a joint one-acre plasticulture garden. 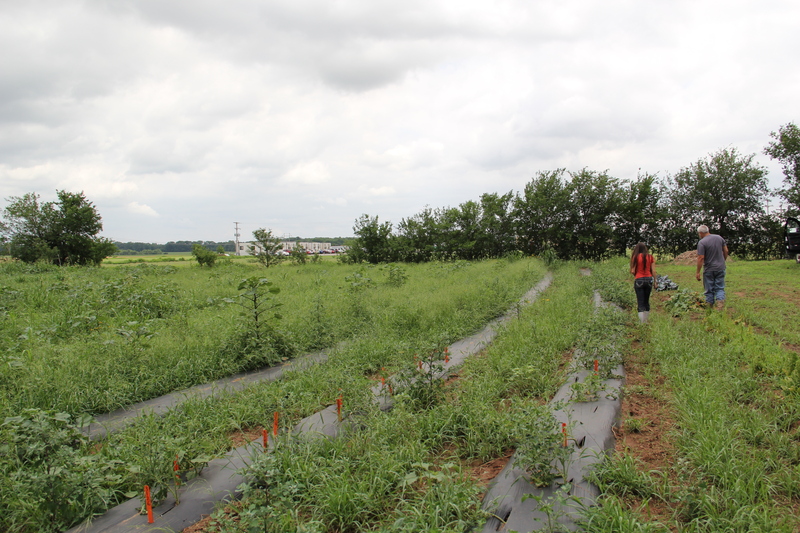 The plasticulture, which was also supported by USDA and the Agriculture Extension Office at Oklahoma State University, involves placing black plastic over furrowed rows of soil. Seedlings are then placed in holes in the plastic, which holds moisture into the soil, and keeps down the weeds. 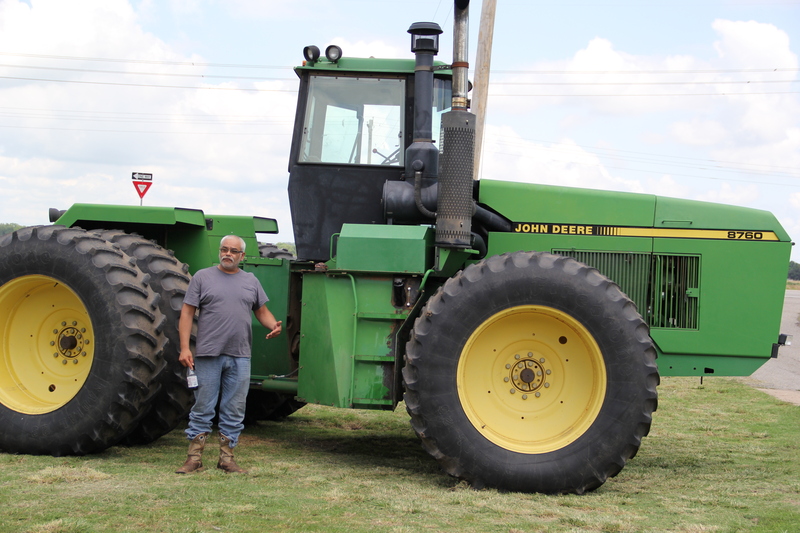 Besides gardens that require a great deal of hand weeding, Amos also has acquired a collection of trucks, tractors and combines to farm 450 acres of land. 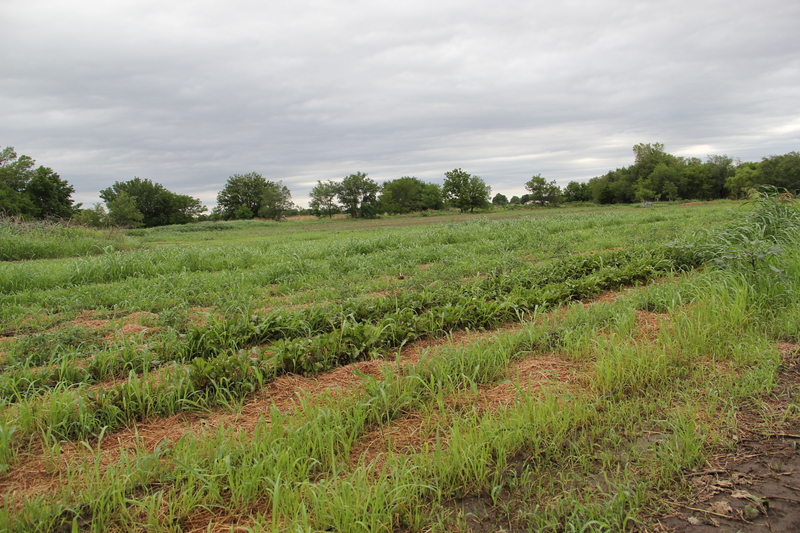 By the end of this year, after the Ponca tribe has agreed to not to renew leases with other farmers in order to lease the land to the agriculture program, they will be planting wheat and milo on 1200 acres of land. What is not consumed by the program’s livestock is sold, and the profit is used to sustain the program. Amos and the agricultural program have also been working on cattle breeding, crossing black angus with longhorn cattle to produce a cow that carries more meat than the longhorn, but is leaner than the angus. By this fall, Amos plans to have 100 head of cattle. The Ponca currently graze the cattle on land once run by the Chilocco Indian School, a boarding school where Native children were sent to learn a trade, from welding to agriculture. 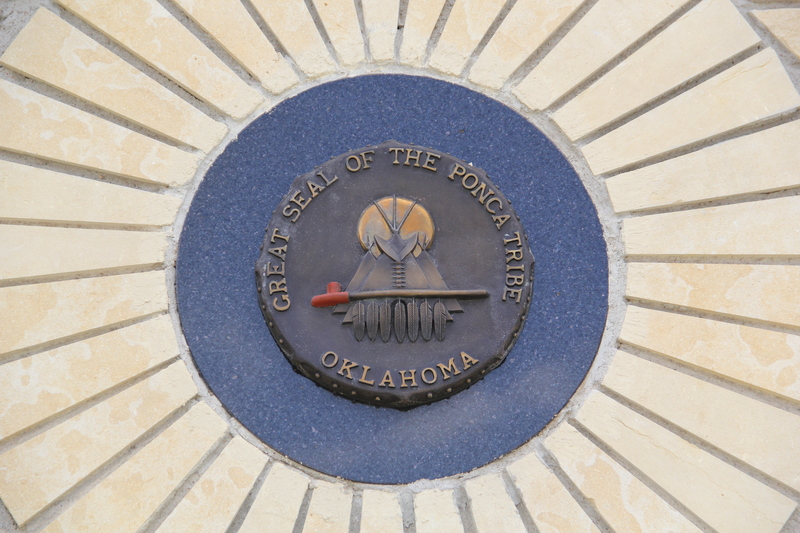 When the school closed in 1980, the land was divided up among local tribes, with the Ponca receiving 827 acres. Most of that land the Ponca rent out to the Otoe-Missouria tribe because they do not currently have enough equipment to farm it, with the remainder used for grazing. 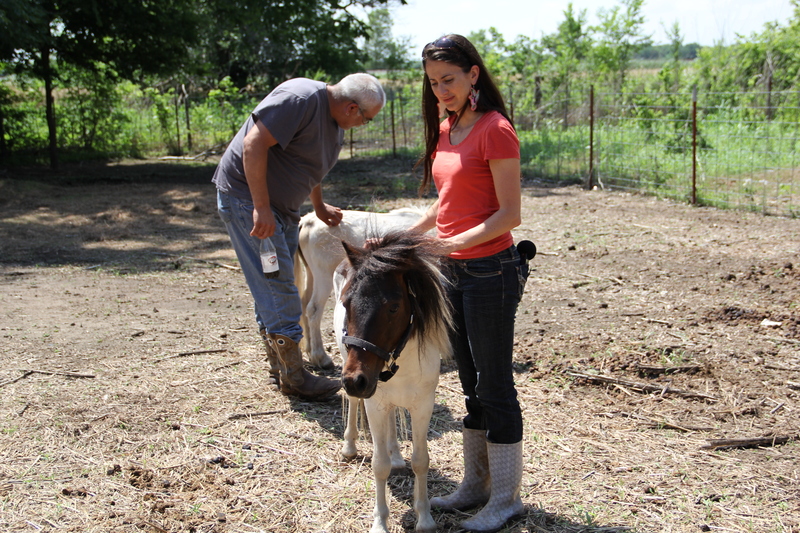 In order to interest tribal youth in livestock, Amos also has a collection of miniature farm animals, including miniature horses and a miniature cow, and soon miniature pigs. 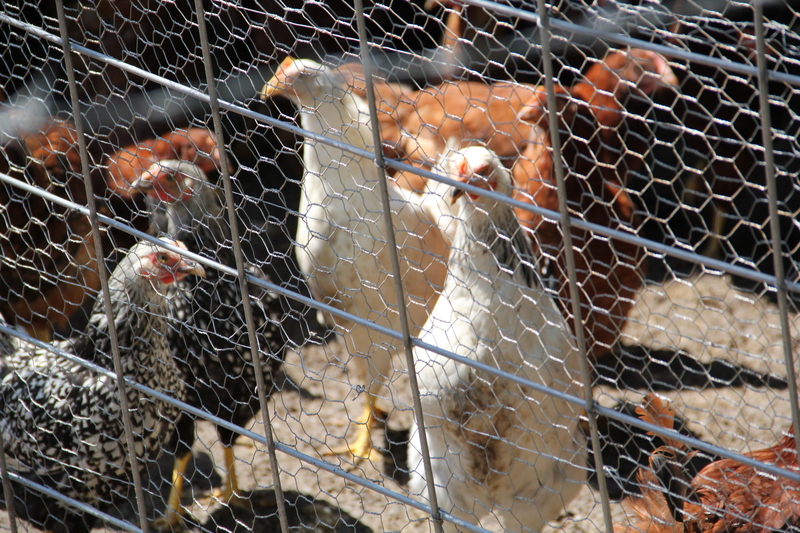 He feels that kids are less intimidated by the smaller animals, and hopes to draw them into an interest in farming this way. 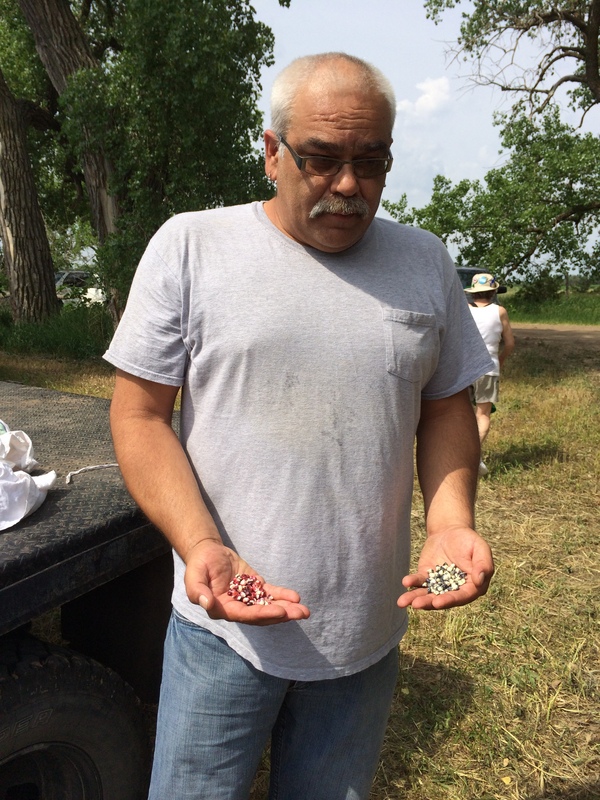 As described in our last post about the Ponca, Amos is also working on a heritage seed project, collaborating with everyone from local seed keepers to corn geneticists to track down 4 of their 5 traditional corns (red, red speckled, gray and gray speckled). According to Will and Hyde’s 1917 “Corn Among Indians of the Upper Missouri” the Ponca also had a sweet corn, which Amos is determined to find, even if he has to seek out the genetics of that corn hidden in the varieties he currently has. Over the years he has been selecting out kernels that resemble sweet corn, and has been working on developing a blue sweet corn. In Amos’ words, “selective breeding brought us 9,000 strains of corn from one grass. That came from a people with a vision. I’m doing the same thing.” He is also working to preserve heritage varieties of watermelon and squash. In two and a half years, the Ponca tribe has gone from not having an agricultural department, to now working with a livestock like cows, chickens and pigs, producing grain for their feed, and producing thousands of pounds of produce for tribal members, all in an effort to make the Ponca Nation healthier and more food sovereign.